I used to see the "Currently" posts all over the web and always enjoyed reading them. Now that I have my own blog, I get to participate in all the fun! Thanks to Farley from Oh' Boy 4th Grade! Here is mine for March. Listening: To HGTV. I love all the design/renovation shows like Property Brothers, Love It or List It, Buying and Selling, etc. I can see a complete transformation in 30-60 minutes. Wish it were that easy in real life. We are having work done on our VERY old, (like 1850's old), house, and it seems never ending! Loving: My SMARTBoard! Though I've now had it almost 2 years, I never take it for granted. Not every teacher at my school who wants one has one. Every year, the district gives out a few more, but you have to write a grant to qualify. I had to try 3 times before I got mine. I use it for almost everything all day long, and love to create products for it! ﻿Thinking: How does everyone else do it? Like crank out multiple blog posts/new products on a weekly basis, while teaching full-time, and in many cases, raising a family? My kids are grown, so it's just my husband and me, (plus a neurotic cat, but she doesn't count.) I know I'm slower than I used to be, and I shouldn't compare, but it takes me a really long time to finish a product. It makes me wonder if some people just don't sleep! Needing: To exercise more. . . sigh. . . I have such great plans . . . I will leave school by 5:00 and go to my local community center, (which has an indoor track), so I can walk for 1/2 hour and still make it home in time to cook dinner and eat at a reasonable time. (I know 30 minutes isn't much, but I've got this Achilles thing going on, so it's a start!) Anyway, the track is right on my way home, so that's not the issue. It's the leaving school at 5:00. Even though I've been there since 7:00 am, there is always JUST ONE MORE THING that I need/want to do. Can anyone else relate? Like: Coffee. . . gotta have it first thing in the morning. . . and I'll still be sipping on it after lunch. Love: My computer. . . I have a problem. . . seriously. . . 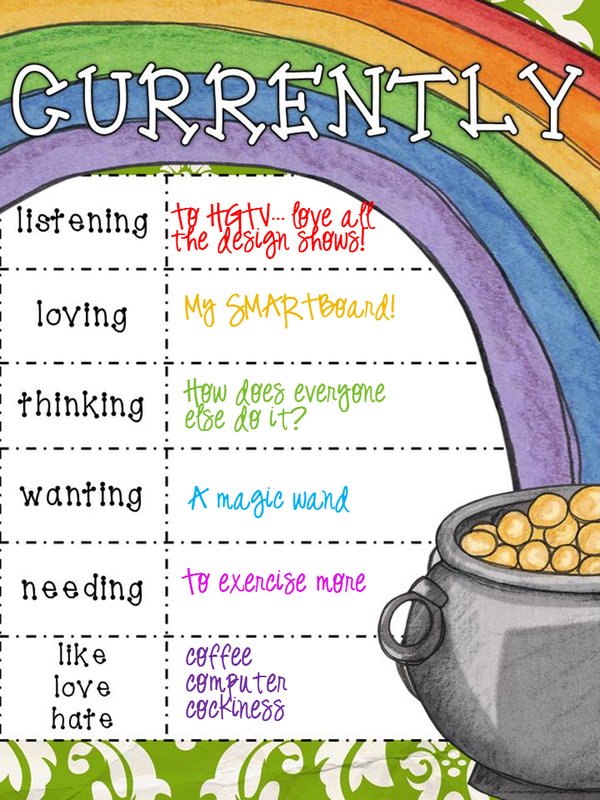 I can get lost for hours going from Pinterest link, to awesome blogs, to TPT, back to Pinterest. . . that's probably part of why I don't feel like there are enough hours in the day. It is so amazing to see the wealth of knowledge, rich discussions, and creative ideas that are being shared online these days! I think my husband gets a little jealous sometimes! Hate: Cockiness...always have, always will...To me, cockiness is very different from confidence. It is that sense that someone thinks they are better than everyone else and that the rules don't apply to them. I want to tell you about a giveaway I am participating in! 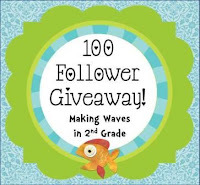 Janet from Making Waves in Second Grade is having a 100 follower giveaway. 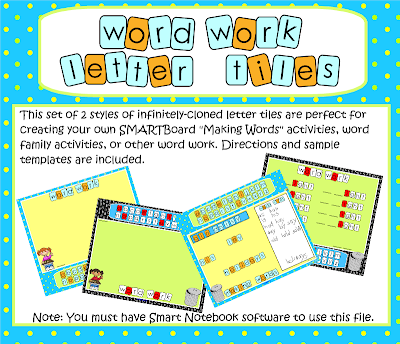 I donated my SMARTBoard Word Work Letter Tiles. It is in the first grade bundle at Janet's blog, but is appropriate for K-3. It allows you to create customizable word work activities for your students that are interactive and fun. I get the exercise thing. I'm not still at school at 5 ... but I am still working. Just at home instead of at school (I'm the teacher librarian who has no office and the library is used for after school care ... so it's pretty hard to get anything done there!). Why is it so hard when you feel so much better when it's done? PS 1850s house? THAT IS AWESOME. Well. I bet the work is hard. But a house with some history? COOL. If history means uneven floors, and everything out of square...yup! We've got history! We think our house was a carriage house for one of the 2 big houses across the street from us. (When we renovated out kitchen years ago, we basically found a barn floor under the linoleum.) We think it was converted to a residence around 100 years ago, which is still pretty old! I love coffee too. Why didn't I think about that one? I agree about you're thinking. I do not think they sleep. Hi Cathy! I found you through Farley's Currently. I agree with you about everything- I like to get to school super early to get things done, because I'm a morning person, and then I can't leave, either. I know how you feel about exercise- I can't wait for a new dance studio to open up so I can sign up! Hi! I found you through Farley's Currently an am your newest follower! I'm a coffee lover as well but not much of an exercise person! Glad I found you through the state bloggy. I'm your newest follower from MAINE! We Maine-iacs need to stick together, don't we? Thanks for visiting! Hello! I am a new blogger too! I have to get my currently posted, I meant to do it this morning, but my Sunday slipped away. I love your font on currently, what is it? I also love my Smart Board although I am not nearly as creative as you! I'd love to learn how to make such fun and interactive products for my 4th graders. I love your blog name! I just went to check it out and am now following you. I love finding more 4th grade bloggers! The font on my "Currently" is from Kevin and Amanda. It's called "Digs My Heart". I love making SMARTBoard products...I watched a lot of online tutorials and just played around with the software...lots of trial and error. Thanks so much for stopping by and leaving me such a sweet comment! Sadly, lately, I am not even managing 30 minutes of exercise. I just cannot get caught up in my school life! I just checked out your blog and am now following you. Looks like you've been at the blog thing quite a while and you had some great stuff there! I look forward to hearing more from you!